This time we the people living in the south Asian subcontinent were lucky to see total lunar eclipse. NASA has released a new video that shows how lunar eclipses work.This was the lunar eclipse with longest totality in the century. However I was not so lucky as cloud prevailed over Hyderabad sky for the whole night. I could find the exact timings in my time zone from WolframAlpha . However thanks to Google and Slooh I could watch it live online. 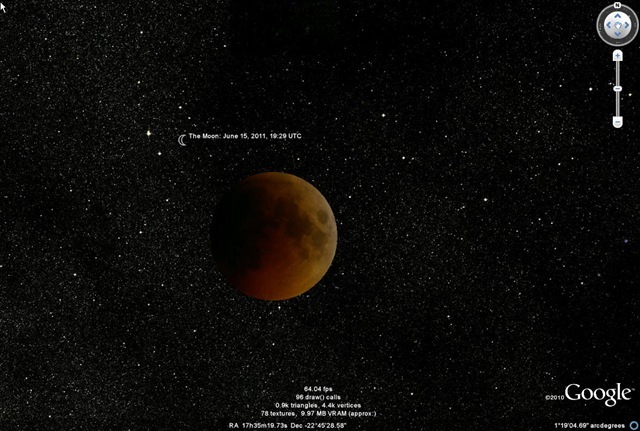 Not only they had live feed in youtube with the expert commentary but also Google earth’s sky layer was showing the 3D like view of the eclipse live.You can watch the full recording here. I Managed to take some screenshots . The live commentary was very helpful , if you are new to astronomy. Following are few facts discussed during the eclipse. One of the amazing coincidence is that Sun and moon look exactly the same in size from earth even tough they are actually so different in size. This is due the fact that the Sun happens to be 400 times the Moon's diameter, and 400 times as far away.This makes total solar eclipse so interesting. Due to larger curvature of Earth’s shadow than that of moon , lunar during eclipse earth’s shadow look much bigger to hide moon completely and there is no such thing called “annular lunar eclipse” like annular solar eclipse. But moon is going away from earth 1 inch every year , so there will be a time in future when earth’s shadow will not be able to cover moon completely and “Total lunar eclipse” will occur no more. We do not see the other side of the moon because it’s synchronous orbit with earth. This is no coincidence. It is an inevitable consequence of the gravitational interaction between those two bodies. Most of the moons in solar system show this behavior. The moon’s color changed to light copper tone during totality is due to light from earth’s circular edge passing through thin layer of atmosphere. But it really depends on the amount of dust and clouds in the Earth’s atmosphere. It can act as the report card of our atmosphere because irregularities in our atmosphere (e.g. due to volcanic ashes ) can cause irregularities in color of moon during totality. According to the commentators our atmosphere is doing fine after they looked at the color of moon. One more interesting thing Google did was that they changed their logo (doodle) to a dynamic one which was showing the life picture of the moon during the eclipse and one could go back in the time using the scrollbar at the bottom and see the shape of the moon changing . Unfortunately it is not yet available in the doodle archives. My Astronomer and Photographer friend Nikhil Tungare managed to find a small window of time when clouds were off the moon and could click some awesome picture of totality from his terrace. In fact he had reminded me of the eclipse a couple of days ago. Here is the Montage of the images . Photographed with 300mm f/2.8 on 5D Mark II from Hyderabad . The next total lunar eclipse is on 11th December this year. Thank you for the incredibly enlightening post, many of us could use more personal blogs like this on the internet. Is it possible to elaborate more on the second paragraph please? I am a small bit puzzled as well as uncertain whether or not I am aware your point completely. Many thanks.